These homemade Oreo cookies are incredibly easy to make! 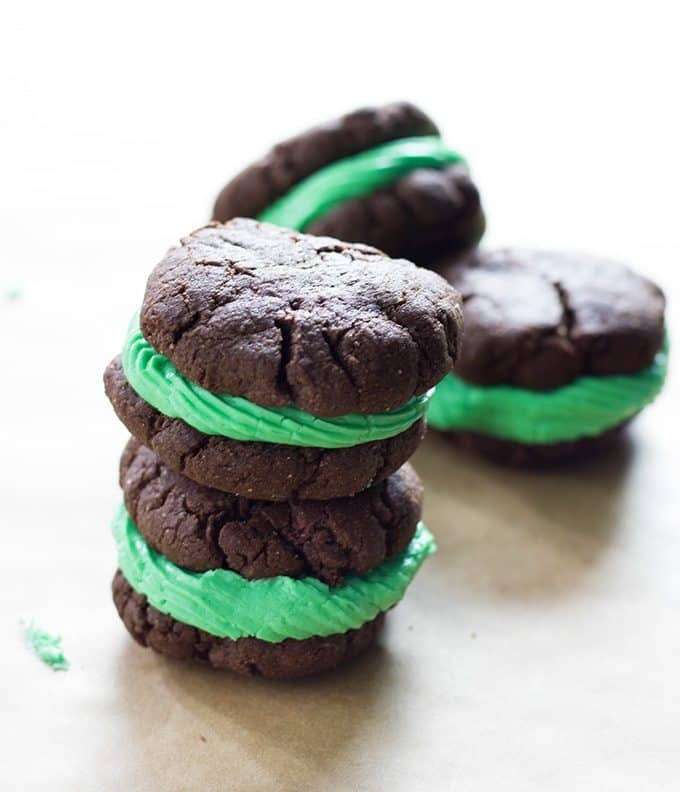 A slightly soft chocolate cookie filled with silky smooth mint cream cheese! Now, if you’ve seen some of my other posts around here like caramel stuffed pretzel cookies or blueberry funfetti skillet cake – you already know I love to bake. This is no different when it comes to the classics! I loved Oreo’s as a kid, my kids love Oreo’s. I still have to try and refrain from buying them every single time I’m at the store…. As a baker, I try to avoid the cookie aisle at the store when possible. I’d rather have something homemade if I can. I know what’s going into my treats, and everything just tastes a lot fresher. No hate to Oreo’s though, I’ll always hold a special place in my heart for those little guys! What’s great about these is they’re pretty stinking easy to make. It takes me about 10 minutes to get this dough put together, and it only needs to chill for about 30 minutes. You’ll notice that this dough is a little bit crumbly – That’s ok, it’s supposed to be like that. I’m going to get really “technical” here and use the term squish, because, you kind of squish this dough into a big ball after you chill it. After that, you can squish it again into a ball and flatten in the palm of your hand to whatever thickness you like. 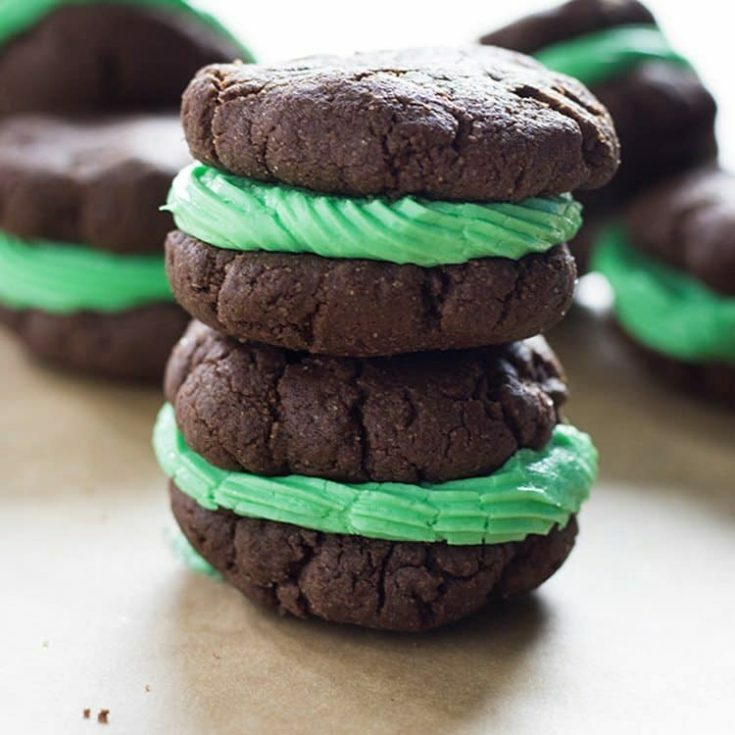 I’ve made these with upcoming St. Patrick’s Day in mind – and that mint cream cheese frosting is to die for! Another awesome thing about this recipe is you can change the frosting for any occasion. You could do almond extract and red coloring for Valentine’s Day. No coloring and just some vanilla extract if you want them to be like traditional Oreo’s. If you’re looking for any other St. Patrick’s Day treats, my lucky charm’s snack mix is also a winner! 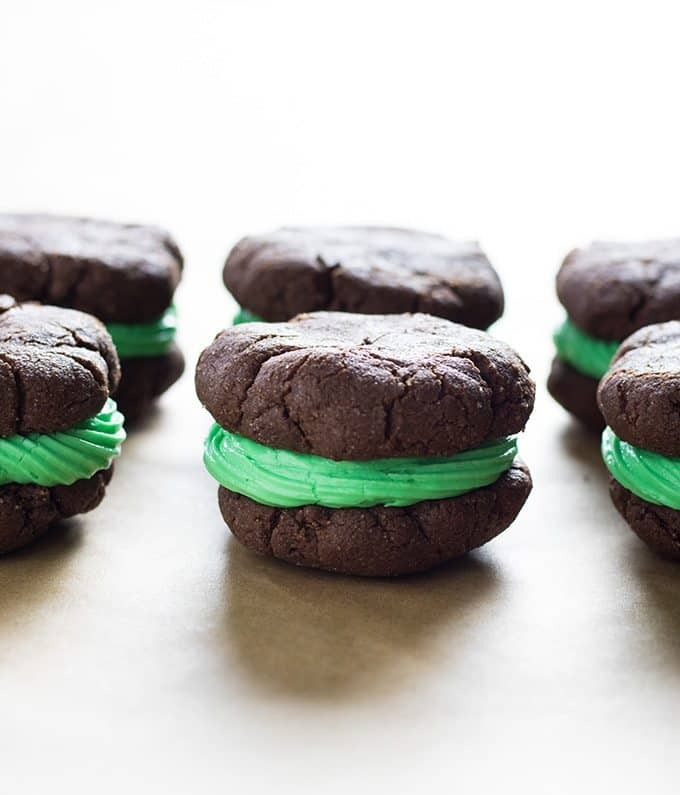 Use a decorator icing bag with tips to pipe the filling onto the cookies. Whisk together the flour, cocoa powder, baking soda, baking powder, and salt in a large bowl and set aside. Using a large bowl and hand mixer or stand mixer fitted with paddle attachment, cream together the butter and sugar for 2-3 minutes until fluffy. Add the egg and vanilla extract and beat on medium speed for 1-2 more minutes. With the mixer on low, add the dry ingredients into the wet ingredients in thirds. Mix slowly just until dough is formed. Preheat oven to 350 degrees. Line two large baking sheets with parchment paper or silicone baking mats. Set aside. Roll the dough into small (about two teaspoons) balls and place on prepared baking sheets. Press dough down slightly to flatten. Bake 6-8 minutes. Allow cookies to cool on pan for 5 minutes before removing to cool on a wire rack. In a large bowl if using hand mixer, or bowl of stand mixer fitted with paddle attachment, cream together the cream cheese and butter for 2 minutes until smooth. Add the mint extract and powdered sugar, and beat for 2-3 more minutes until well combined. Stir in green food coloring as desired. 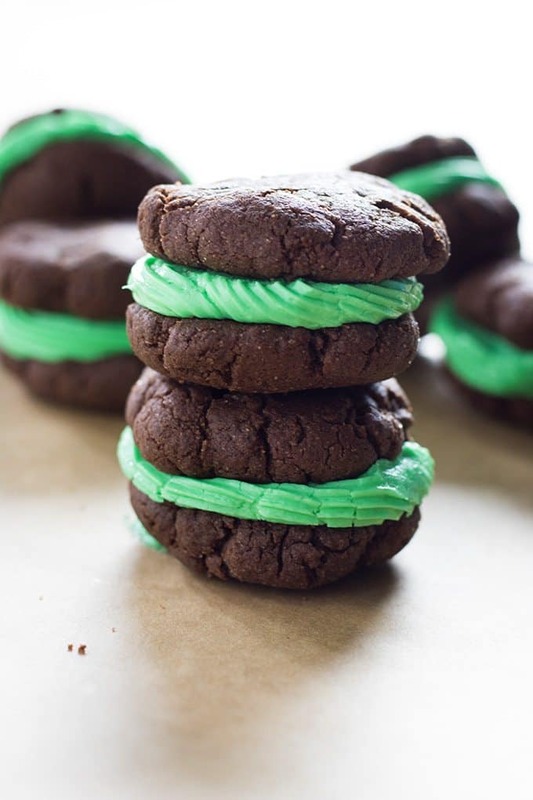 Use a decorator icing bag with tips to pipe the filling onto the cookies.